When French beauty house, Clarins opened in 1954, no-one understood that its founder, Jacques Courtin-Clarins was an early wellness warrior who took an holistic approach to skincare, which was ahead of its time. It was a philosophy that would come into vogue decades later. A devotee of natural plant extracts, Clarins understood that the best skincare evolved from using the natural products that felt sensual to apply as they worked on the skin. His message for all women is that everyone is beautiful in their own way and the role of the cosmetic house is to enhance that inner glow. 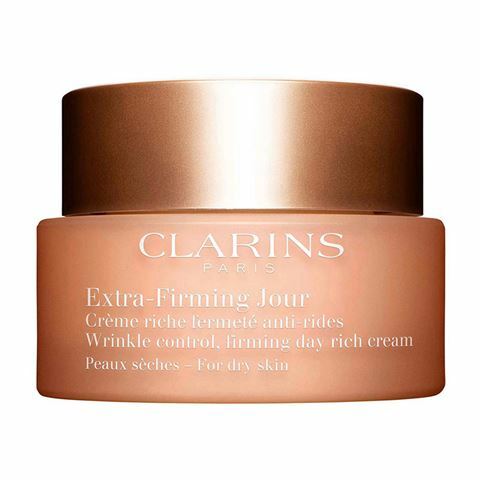 Clarins Extra-Firming Day Cream is the ideal anti-aging day cream for those 40 and over. It has a lightweight, melt-in texture and matte finish to prime the skin for make-up. It promises to promote firmness and lessen wrinkles, as well as promoting the skin’s elasticity. Especially formulated for dry skin. Contains kangaroo flower extract to visibly fight skin's loss of texture to leave it looking plump. Mitracarpus extract to help with elasticity and oat sugars for smoothness. Apply after cleansing and toning the skin in the morning. Presented in a Clarins box.